Managed by the government with the public investment, Hubei Museum of Art is a non‐profit public welfare cultural institute planned and constructed to meet the cultural and artistic demand of the public according to the objective of modern multifunction. The museum takes “Bring local cultures to the world, focus on the contemporary art rooted in our heritages” as the concept of museum running, and art exhibition, collection, research, education, exchange and service as the major objective, and aims at a high‐grade specialized museum of art with unique characteristics. Located by the East Lake in Wuchang district of Wuhan city, Hubei Museum of Art is provided with nice environment and convenient traffic. It is adjacent to Hubei Provincial Museum and is one of the symbolic cultural buildings signifying the achievement in cultural construction of Hubei province. The Museum covers an area of 15,318 m2. The main building is composed of four over‐ground floors and a basement. With a total building area of 25,000 square meters, it takes a total investment of 140 million Yuan, including 100 million for construction, and 40 million for land acquisition. The Museum is designed based on the functions and facilities. There are ten exhibition halls with an area of about 5,000 square meters. The total exhibition line extends over 1,200 meters and is enough for simultaneous or separate exhibitions of different forms and subjects. Since its opening in 2007, with more than 70 exhibitions, over 40 seminars and over 20 academic lectures successfully held, Hubei Museum of Art receives 300,000 audiences on average each year and has gained great social effect. It has gradually developed into an important window and academic platform in Hubei Province for academic discussion, art works collection, popularization of aesthetic education, and promotion of cultural exchange. Among the art museums in China, Hubei Museum of Art was one of the first to open for free to the public on October 30, 2008. 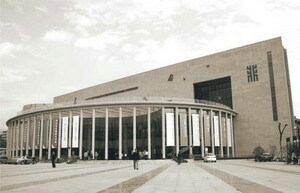 In July of 2010, It was renamed “Hubei Museum of Art” from “Hubei Provincial Museum of Art”.